AJ’s Garage Door Service of Oro Valley is pleased to announce they are making it easier than ever to get your garage door fixed, including on Saturdays. With same day service in most cases and no additional fees charged just because it’s the weekend, AJ’s aims to help more people in Oro Valley at a time that is convenient to them. Garage door problems always seem to happen at the most inconvenient time. Finding that a garage won’t open or close all the way just as it’s time to leave for work or to get the kids off to school is a problem that stresses a lot of people out, and with good reason. However, many of these stressful situations could be avoided through proper garage door maintenance, according to Jennifer Banks of AJ’s Garage Door Service. “It’s amazing how many times we hear people tell us that they had a feeling something was not quite right with their door and had meaning to get it looked at” explained Banks. It could be an odd noise, the way the garage door moves, or just inconsistent operations that customers say they had noticed before things went completely wrong and their garage door or opener just stopped working completely. According to Banks, the reason most often given by customers as to why they waited to get the issues addressed is because they didn’t want to take time off of work. “In an effort to make life easier for our friends and neighbors here in Oro Valley and all around Tucson, we wanted to make sure they knew they could count on AJ’s to help them, even on Saturday, at no extra cost” said Banks. 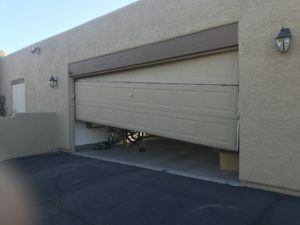 While certain issues such as a broken garage door spring, which will leave a garage door completely inoperable, may be something that needs to be addressed immediately, regardless of the day of the week, there are other issues that can more easily be scheduled. General garage door maintenance which can prolong the life of your door, springs and electric opener is one example of a service that can be done at any time. Same with replacing an old garage door opener. The fact is that a garage door can weigh over 300 pounds and has hundreds of moving parts that are all critical to it working properly. The springs that help make such a huge door manageable are made of metal, which eventually wears out and breaks. The electric garage door opener that controls the door has hundreds of parts itself. With so many critical components affecting the operation of what is the main entry and exit to the home for many people, it’s no wonder that eventually something is going to break. And it becomes clear why it is so important to make sure your garage door and all its parts are working well. With service calls typically lasting less than an hour, whether it’s for the installation of a new opener, the replacement of broken springs, or a complete door rebuild, AJ’s trained service techs work quickly while maintaining the utmost professional standards. “Garage door maintenance and repair doesn’t need to take all day and it doesn’t need to cost a small fortune” stated Banks. AJ’s Garage Door Service says its’ aim is to offer fast, friendly, professional and affordable service throughout the Tucson area, with exceptionally quick service in the Oro Valley area where Banks and her team are based. And they’re pleased to let everyone know that their reasonable pricing is the same every day of the week, including Saturdays.